Executives engaged in the process of Nine-Boxing frequently stumble when it comes to taking actions to address employees in the shallow end of the talent pool: those with little future potential and sub-standard performance. 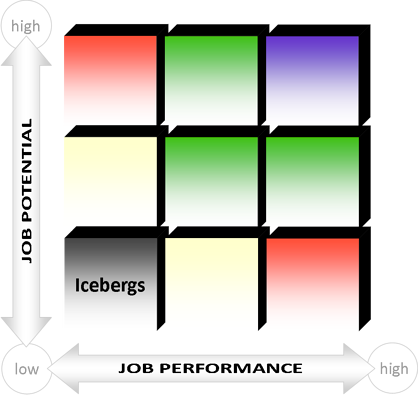 Employees in this dark corner of the performance-potential matrix are often said to be Icebergs, not because you can only see the tip of their potential, but because they are capable of sinking your organization. An often overlooked component of succession planning is the ability to recognize a failure of the system - people with no potential and below average performance who need to be moved rather quickly to another box, or be moved out of the organization. Regrettably, we all too often see the investment of more resources rather than fewer in dealing with Icebergs. So what to do with your Icebergs, the people who are clearly in the wrong role or maybe even the wrong or ganization? Action plan with the individual to find a more appropriate assignment for them. You may be able to facilitate placement of the person into more fitting roles with more suitable direction, purpose or opportunities. If you want to retain the person, consider taking a performance management approach instead of a developmental approach; an improvement action plan rather than a tailored developmental plan. Coaching and feedback should be remedial. Some Icebergs may be "stuck" due to issues they perceive to be beyond their control. Anything ranging from personal (e.g., family crisis, life change) to professional (conflict with a co-worker, discomfort with a work practice). As such, you should counsel, build trust and try to understand the issues. Clear road blocks and set them on the path toward improved performance and (perhaps) improved potential. In a few cases, your inquiry may reveal hidden potential toward a path different from the one prescribed by their current role. Uncovering these disconnects often leads to a new understanding of what role the employee should be in. The Iceberg in these cases is a misfit and needs to be reassigned. One last consideration for you: An often unforeseen consequence of not dealing with Icebergs is that they can form a sort of plaque in your organization, clogging the arteries of development and keeping others from realizing their full potential. Because of this, it is important to identify and remove Icebergs that are blockers, poor performers with a limited future who stand in the way of potential stars. If you are unable to find an individual contributor role for the Iceberg and all performance management efforts have failed, assisting in an exit from the organization is probably the best option for all concerned. Do NOT spend any more money confirming what you already know by RE-assessing potential or RE-evaluating performance. If you have done the work to establish your Nine-Box and appropriately classify your talent pool, you should spend the least amount of developmental time and dollars in the dark corner of the Nine-Box. Focusing on Icebergs can lead to missed opportunities, or, worse still, losing more capable talen to the competition. Recently, I had a conversation with an HR colleague of mine who works for an organization known for its skill in developing talent. I mentioned Nine-Boxing and what to do about people in the lower left-hand corner. She said, "Oh, you mean 'Low-Hanging Fruit.'" In her high-performing organization, those who aren't 'up-to-snuff' stick out, and the company has an established process for keeping this corner of the Nine-Box cleaned up. THAT'S THE GOAL: identify and take action without pouring your valuable developmental dollars into a box that rarely yields results for your organization.